Sr. Jo Langley (FMM) is part of a lively parish family remembered by many with affection. We are grateful to her for providing us in 2009 with this memoir of her family and its involvement with St. Edward’s Parish. Mr Frederick George Langley was a civil servant. He moved to Kettering from north London in 1913. He was married to Gertrude Mary Sullivan and they lived in Trafalgar Road, where their eight children were born. Until the twenties Kettering was a small, thriving market town with the cattle, sheep, pigs etc. being driven there each week for the market (now a car park). The catholic population was likewise, small. I do not think there could have been more than 60 families attending the services in our church, which is now St Edward’s Hall, the Grove. The Langley family was always fully involved in the parish: St Vincent de Paul Society, the Blessed Sacrament Guild and later the Knights of St Columba, the CWL etc. 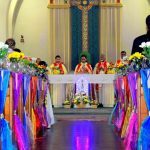 Church was an integral part of the family life. 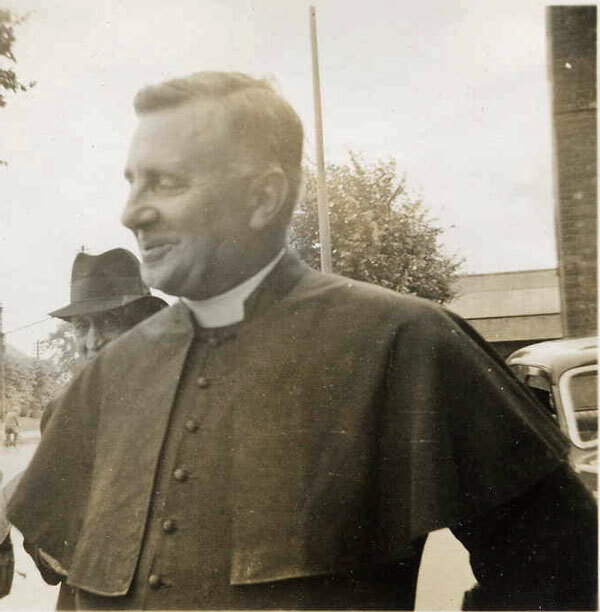 The Dominican Fathers from Laxton, were the usual supply priests for Fr Lockyer and often my Father was called upon to drive them to and from Laxton and that usually included a visit to Trafalgar Road. My mother, especially always had an open house (maybe her Irish inheritance!) When the family car was bought many trips were made to the surrounding villages (before that we walked to them!). I remember Corby, as a beautiful little village with a single steel furnace, similar to the Kettering furnace that lay off the Rockingham Road near Thorpe Malsor. Then came the great development in Corby and with the influx of Germans, Scots and Irish the catholic population increased in leaps and bounds and Kettering took on a totally new character. 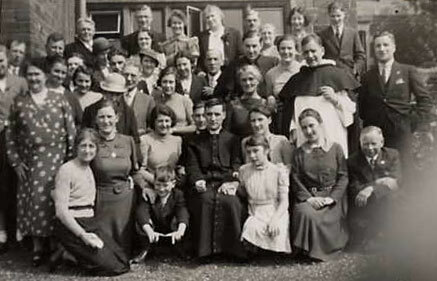 Until 1938 there was no Catholic school in Kettering. For Mr and Mrs Langley a catholic education for their children was a priority, so in 1929, the two elder boys, Gerard and Basil, were sent to Westminster Cathedral Choir School, (the second born, Peter died in the Scarlet Fever hospital on Rockingham Road in 1917 at the age of 2 and a half and is buried in the London Road cemetery). 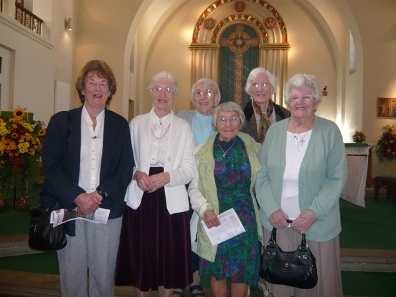 The girls – Josephine, Agnes, Margaret and Mary all attended Notre Dame High School, Northampton. With the advent of the Ursulines and the opening of a school in 1938, Mary transferred here as did John, the youngest. 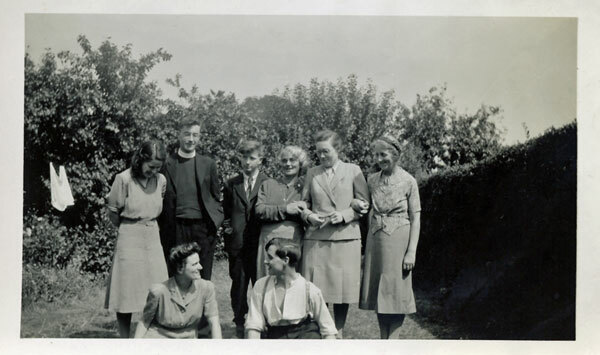 Mary completed her schooling at the Ursuline Convent and John moved to Laxton in 1940. Canon Hunting was the great figure in the changing life of Kettering and thanks to him there is such a beautiful place of worship. All the parish were involved in its building and I remember the Canon having samples of benches so the parishioners could make known their preference for the type of seating – which had to be comfortable! I have a memorable picture of Canon in his ‘plus fours’, with the inevitable cigar in his mouth, sweeping away the snow from the path in front of the presbytery and church along the Grove. In Lent the cigars were always untouched! 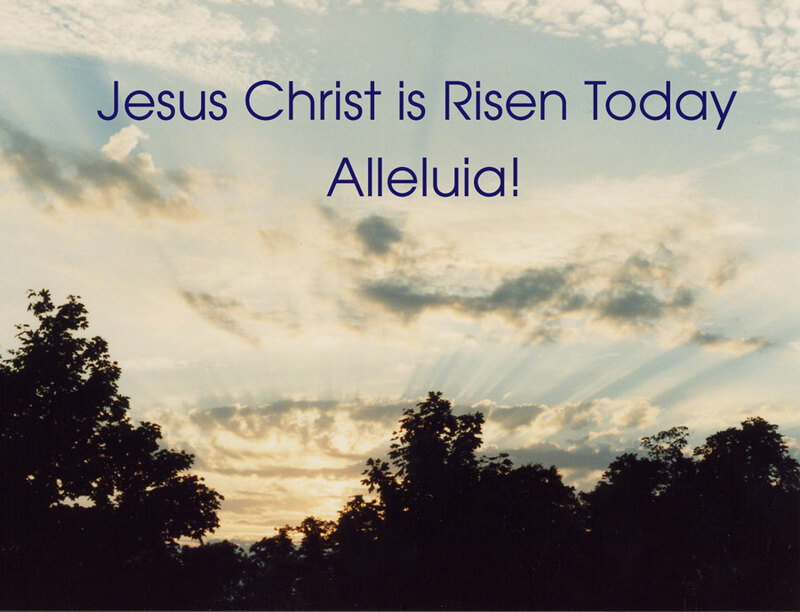 A truly great and holy man! The outbreak of war caused another sweeping change to the parish. First with the arrival of the three Catholic schools and later with the American forces that were based round Kettering. The Langley family were greatly affected as were all the parishioners. 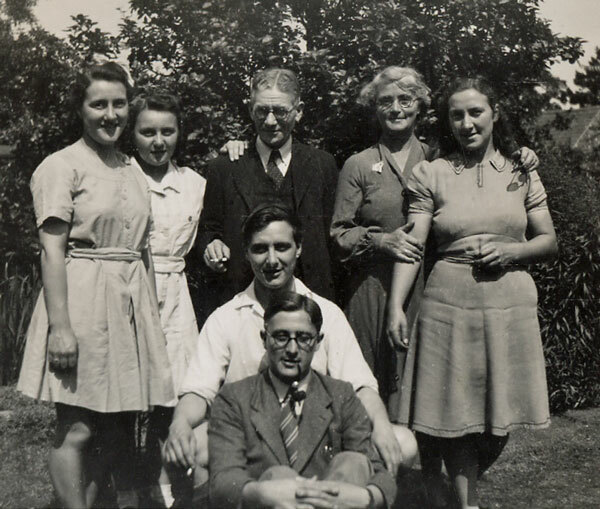 In the early 20s the Scanlon family had moved to Kettering from Yorkshire and Canon Tonks asked the Langleys to befriend the new arrivals and thus began a friendship and relationship that has endured to date. Throughout our childhood Mr and Mrs Scanlon were my parents best friends and our favourite place of play was in the gas works – where Mr Scanlon was manager – we even had a tennis court there. This friendship was cemented when Kathleen Scanlon, the second daughter, married our first cousin, Kevin O’Malley. 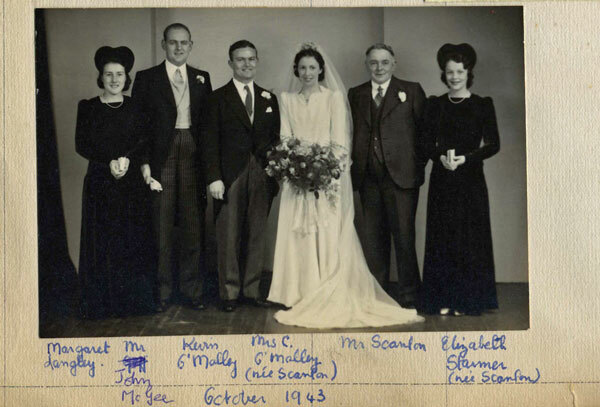 They were married in St Edwards in 1943 and Dr and Mrs O’Malley lived their whole married life in Leicester. The third Scanlon girl – Frances – married Tom Roberts – and the line continues in Kettering to this day. By 1940 the Langley family had moved to 91 London Road. In that year Basil was married to Eva Botterill (a school friend of Josephine) in Northampton Cathedral, Gerard was ordained priest in Oscott on April 21st, saying his first Masses in St Edwards, and in the convents. In September Josephine entered with the Franciscan Missionaries of Mary, John went to school in Laxton. So that meant there were rooms available in 91 London Road! Throughout the ensuing war years evacuees filled them. 91 then became a meeting ground for evacuees and American chaplains and men. (see accounts by Roisin and Maureen). Diaries kept by Agnes reveal an unending stream of visits each day and far into the night. Great thanks are due to Father Adrian Polleti (and others) for all they did especially for the children in the parish. 91 was always open – doors were locked when all the normal residents were out – but the bay window in the dining room was kept unlocked and visitors would avail themselves of that entrance… and floor space was always there when all the beds had occupants. After the war the same openness continued. In 1944 Margaret entered with the Franciscan Missionaries of Mary and in 1945 Mary was married in St Edwards to an American airman, George Lehman, who had frequented 91 as chaplain assistant to Father Polleti. So, Agnes was the only child still at home.. and so she remained over the ensuing years. She, with my mother and father, continued their total involvement in the life of St. Edward’s especially when Bishop Grant was the PP. He and all the many assistant priest were frequent visitors. Back in the old church – I am unable to give the date – Mr Langley took charge of the repository the care of which he passed on to Agnes who continued this work well into the new millennium (I believe – though I do not know the year she handed it over to the Saunderson family). After my father died on November 1, 1959, my mother and Agnes lived in 157 London Road, and when my mother died twenty years later Agnes moved to 113 Greenhill Road. It was sometime between 1959 and 1979 that Agnes took over the work of keeping the archives of St Edward’s. 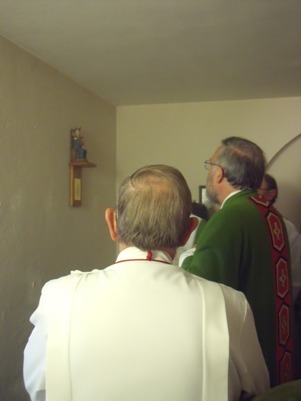 For the ensuing 25 years Agnes continued to be at the service of the parish. She was often called to drive priests and people. Before my father died he said to Agnes that she must learn to drive and said to her, when she obtained her driving licence: “Now remember, this car is for the use of others!” Agnes upheld that injunction to the end of her driving days on Easter Sunday, 2004, when she suffered a minor stroke after driving some of the Sisters to the 8am Mass. She left the car in the driveway of her house – ready for the next call…. But she never drove again. In October that year she moved to Nazareth House in Northampton, where for two and a half years she continued to devote herself to the work of St. Vincent de Paul, visiting the residents regularly. On Monday, March 12, 2007 Agnes attended the St Vincent of Paul meeting at the convent of the Sisters of the Holy Spirit, Northampton driven by a faithful friend – The following morning she had a stroke and died on March 21 from a heart attack. 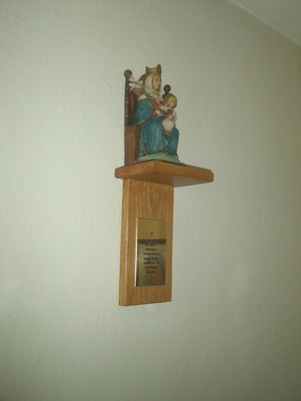 In 2009 the Langley family donated a statue of Our Lady of Walsingham to St. Edward’s Church, Kettering. The blessing took place in September 2009.